The nuclear disaster at Fukushima Daiichi continues to push the limits of what was largely considered unimaginable before the March 11th earthquake and tsunami crippled four reactors at the nuclear power plant. 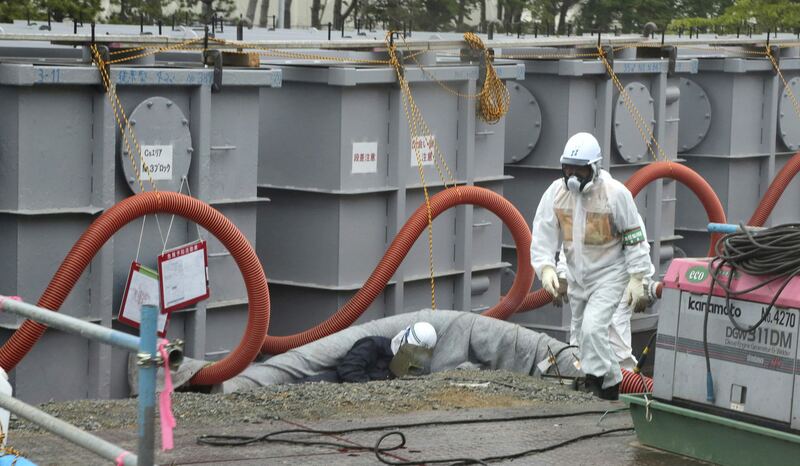 In April of this year, TEPCO warned that it was running out of space to store highly contaminated water being generated at the plant and requested permission to dump groundwater into the ocean, claiming at the time that it was only contaminated with “low-levels” of radiation that would quickly be diluted in the ocean. After failing to get the necessary permission to dump the groundwater into the ocean, TEPCO announced that cesium, strontium, and tritium levels in groundwater around the plant began soaring, inferring that highly radioactive materials are leaking out of the reactor buildings, collecting on the sea side of the plant, before finally escaping into the Pacific Ocean. In the last week, cesium-134 levels just 25 meters from the Pacific Ocean have increased more than 90 times, to over 9,000 becquerels per liter. Newspapers in Japan are also covering the potential restart of nuclear reactors in the island nation, as four utilities have filed applications with the Nuclear Regulation Authority to restart 10 pressurized water reactors at 5 nuclear power stations, after new safety standards were passed and went into effect. Hokkaido Electric Power Co., Kansai Electric Power Co., Shikoku Electric Power Co., and Kyushu Electric Power Co. all submitted applications to the NRA in hopes that they will be able to restart their nuclear power plants early next year. Unlike other reactor designs, pressurized water reactors in Japan have been given a five year grace period before they will be forced to adhere to the new safety standard that they install an “exhaust facility equipped with filters”, which allows utilities to alleviate the financial burdens imposed by keeping their nuclear reactors shut down despite not being able to comply with all safety regulations. While some may claim that the government has a responsibility to restart the nuclear reactors, no one can argue with the fact that utilities are facing a life or bankruptcy situation in terms of the restart, and that in the face of crippling financial debt, utilities are seeking a restart now – consider safety consequences later approach. The four utilities which applied to restart their reactors generate more than 40% of their electrical supply from nuclear energy. In 2012, Japanese utilities which relied upon nuclear power plants incurred a combined loss of over $2 trillion yen as their nuclear reactors remained shut-down and required extensive safety upgrades. All four of the utilities which applied for restart have also applied for rate increases and threaten further rate hikes could be sought after in the future if nuclear reactors are not promptly restarted. “The reactivation of reactors is necessary not to inconvenience our customers with higher electricity rates,” said Toru Yoshizako, executive vice president of Kyushu Electric. Despite the LDP’s best efforts to prevent the future nuclear policy of Japan from becoming a key campaign issue, it may dictate future election results after all. A telephone survey conducted by the Asahi Shimbun this weekend found that nearly half of respondents oppose the LDP backing the restart of nuclear power plants, and 70% of respondents said the nuclear restart issues will affect their vote in future elections. The LDP is the only political party in Japan which advocates the continued dependence on nuclear power and immediate restart of all nuclear power plants deemed safe by the NRA.